End of the line for my ecs? My ECS light is stuck in tour. I checked all strut connections and just did a capacitor kit in the module. It didn't resolve the issue. From what I read that probably indicates a strut or struts are out. Is that the consensus? It may be worth mentioning my car is lowered on the factory ECS . Re: End of the line for my ecs? In my limited experience, a dead switch in a strut will result in a system fault that causes the ECS to go offline and flash both Tour and Sport together. Therefore, I wouldn't rule out the ECS module for a "stuck in tour" situation. Get a cheap analog multimeter and do the fault check on the system and see what that turns up. So you think even though it's not flashing it could be that? You suggest checking the strut cap contacts with a multi meter? Is there any engin code it will through you are aware of? 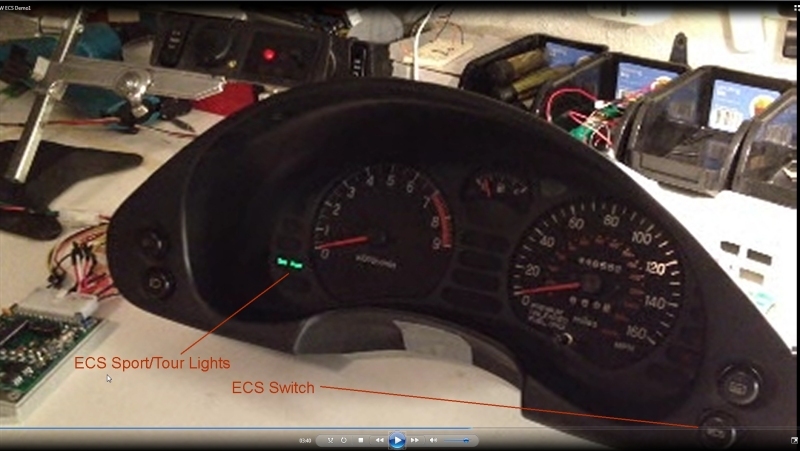 You can test for fault codes in the ECS controller using an analog multimeter through the diagnostic port (under the kick panel or by the fuse box, depending on model year). Should be able to find instructions on the forum here. My ECS light is stuck in tour. If you press the ECS button , the ECS light is supposed to change from Tour to Sport. If its not doing at least that - then something is wrong with either the ECS button, the ECS button wiring harness to the ECS controller or something is wrong with the ECS controller itself. As JJ94tt said - if you have a bad strut , the OEM ECS controller is supposed flash both Tour and Sport together about every 30seconds. (3) or something is wrong with the ECS controller itself. To determine if it's (3) to see if your ECS controller has failed - then a simple way to tell that is to temporarily disconnect one of the front cap strut connectors. This will cause a fault that a good working ECS controller should detect and it should start flashing Both the Tour & Sport light. If it doesn't it's definitely the ECS controller that's the problem. If it does start flashing the Tour & Sport light - it could still be any of the three. Also just to be clear we are all on the same page (this has happened before) the Sport/Tour lights in question & the ECS button in question that control the suspension are the ones shown below in the picture. Sometimes new owners confuse the ECS Sport/Tour lights with the tunable exhaust Sport/Tour system. Thanks for all the great responses ! I have some work to do now. It did have both tour and sport lights on when I first bought it. I assume one has burnt out. Also this is an NA so there isnt active exhaust. I will try your recommendations and see what I can find, I was just hoping it's not the actual struts. Well I disconnected one of the struts and the lights didn't blink. When I first opened the ECS box it had some caps leaking. I put the new caps in but maybe I just did a lousy job. Any reason is a great reason to get the Tein Coilovers. Dollar for dollar the best purchase i ever made for my 3000TT's...by far, and I had every mod. Yes i did, I even had the second CC clutch that RPS ever made. Matt Monet had the first. Whatever. (ok, this kinda got away from me). Sorry to be off topic but what brand Tein?